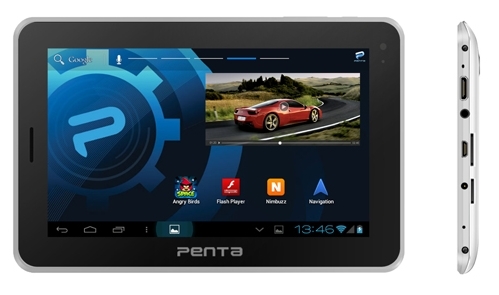 Penta T-pad WS707C tablet launched with SIM card slot. The price of the tablet is Rs.7,999. The main feature is, it support voice calling via 2G network. It come with 7-Inch capacitive multi-touch screen with 3D graphic support and 1024 x 600 pixel screen resolution. The tablet is 10.5 mm thick and 340 gram weight. It runs on Android v4.1 Jelly Bean operating system and powered by 1.2 GHz Cortex A9 processor and Mali 400 GPU. Penta T-Pad WS707C Tablet built-in with 8 GB of internal memory for storage needs, and it expandable up to 32 GB via Micro SD card slot. It has 1 GB of DDR3 RAM and 3000 mAh powerful rechargeable battery. It sports 2.0 Mega pixel rear facing camera and 0.3 Mega pixel front facing VGA camera. The tablet features connectivity facilities through Wi-Fi, 3G, 2G, USB OTG, HDMI port, Bluetooth and it has a 3.5 mm audio jack. This tablet come loaded with popular apps such as NexGtv, Facebook, Skype, Youtube, and even more.